Located in the northwest of the United States, Idaho is the 14th largest state in the Union. It is known as the “Gem State” because of deposits of a large variety gemstones. Idaho is a mountainous area and is well known for its agricultural activities; Iowa is particularly famous for its potatoes. Other important industries include food and wood processing, machinery, electronics manufacturing, mining, and tourism. When incorporating in the USA, foreign entrepreneurs should feel assured knowing that their personal assets are protected. Corporations and limited liability companies separate the assets and liabilities of companies from the personal assets of the business owner. In many instances, forming a company is the first step for a non US resident to open a bank account. A US bank account gives businesses access to a debit card, and the potential to open a merchant service account. Internet commerce is made much easier with a US bank account because companies like PayPal, Amazon and EBay considered you more qualified as a vendor. Idaho law mandates that a C corporation or an LLC must not have a name that is the same or could easily be confused with a business already in existence. To make sure your business name is eligible Inc. Plan can help you with choosing a unique C corp or LLC name. A unique corporate name enhances your company’s reputation and also helps protect the identity of your brand. The type of business entity you choose in Idaho determines the nature of the charges your incorporation will be submitted to. For instance, C corps will be subject to a franchise tax based on the net income of a business. LLCs are subject to taxes based on its members’ personal revenue. Idaho does not have any residency requirements. Owners and directors do not need to live in state to legally operate an Idaho company. However, before your firm is legally eligible to operate, make sure you possess all the required business licenses, permits, and tax registrations. If you need assistance, Inc. Plan can help you stay in compliance with state law. Corporations and LLCs must have at least one owner/director. It is not required to list the directors in the Articles of Incorporation, but when a Certificate of Formation for an LLC is formed, the name and address of at least one manager or member must be included. LLCs must contain the terms “Limited Liability Company”, “Limited Company” or the abbreviations “Ltd. Co.”, “LC”, “L.C.”, “LLC” and “L.L.C.”. The words “Engineer” or “Survey” must be approved by the engineering board in order to be included in the LLC name. 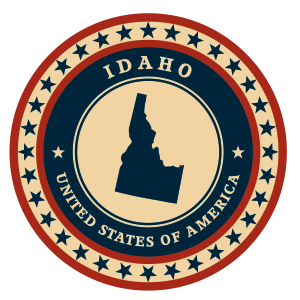 Idaho requires any new LLC file a Certificate of Organization with the state. Idaho LLCs must file an annual report due before the end of the month of the formation date. This annual report does not have a fee attached to it. The Certificate of Organization must contain the name and address of a registered agent who resides in Idaho, and who is available to manage legal and tax business documentation. For more help with filing an formation or for registered agent services, feel free to contact Inc. Plan (USA). In Idaho LLCs are taxed either as partnerships or as C corporations, for state tax purposes. If an LLC chooses to be taxed as a partnership, then it will be charged based on its members’ personal income. C corporations are charged corporate income tax based on the net income. The state also requires an EIN for Limited Liability Companies that hire employees. Each of the 50 American states has its requirements for incorporating. The essential requirements for C corporations established in Idaho are as follow. Idaho allows organization names that include the terms “Company”, “Corporation”, “Incorporated” or “Limited”, along with their abbreviations. However, the words “Company” or “Co.” cannot be preceded by the term “and” or the symbol “&”. Any inclusion of the words “Engineer” or “Survey” in the incorporation name must be approved by the engineering boarding. In order to form a C corporation in Idaho, entrepreneurs must file a document called Articles of Incorporation and an annual report due before the end of the month in which the corporation was formed. There is no fee required for the filing of the annual report. The Articles of Incorporation require a listing of the company’s authorized shares and their assigned par value, as well as the name and address of a registered agent with a physical Idaho address. Inc. Plan (USA) can help you with the necessary filings and also provide qualified registered agent service. Corporations in Idaho are subject to a corporate tax. This tax is calculated based on the company’s net income, at a rate of 7.4%. All businesses must pay a minimum $20 tax and a $10 permanent building fund tax. Companies can pay an alternative tax of 1% of the gross sales volume if the firm’s activity consists only of sales, if it doesn’t own any tangible property in Idaho, and if the annual gross sales do not exceed $100 000.